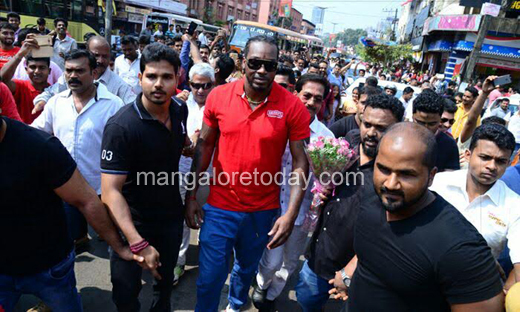 Mangaluru, Feb 05, 2017: Renowned West Indies batsman Chris Gayle who is most popular among Indian cricket thanks to this explosive batting in IPL, was in the city on February 5 for the launch of a new product of Smirnoff. Gayle is the brand ambassador for Smirnoff. He was accorded a warm reception at Rathna’s Wine Gate at Balmatta and was offered the refreshing healthy tender coconut drink by Wine Gate Manager Ramesh Shetty. A host of Gayle fans had gathered at Balmatta to catch a glimpse of their favourite cricketer. Speaking on the occasion Gayle said he loved being in Mangaluru and added that it was a nice experience. Many took selfies and got autographs from the cricketer. After a short visit Gayle later left the venue for Madhuvan Village Restaurant for lunch.